Hello Friends today i am going to explain you How To Hack Facebook Account Password using Tabnabbing method. 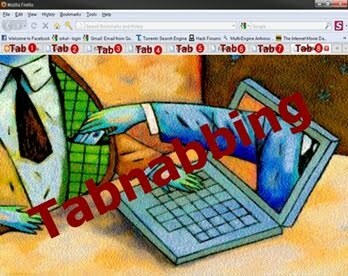 Tabnabbing is a modern type of phishing method used to hack websites passwords. As we all know normal Phishing attack is easily detectable on many site such as Facebook,Gmail, yahoo etc. Like Facebook has implemented an extra code that validates the previous arriving URL and some basic functions. If it founds that page from which you arrived is a Facebook Phish or fake page, it displays a warning message to user that You have been arrived from fraudulent or fake page. So please change you Facebook account password immediately. So Victim easily came to know that was made fool by someone and he changes his account password again. For more information about Tabnabbing and how to How to protect yourself from Tabnabbing refer the Last post. 1. Free Download Facebook Phisher package to hack Facebook Password. Extract the folder " TabnabbingbyHackersLife "
3. Now, to any anonymous webhost (any u like), upload this files Facebook.html ,Login.php and Google.html. You can use my3gb.com, 110mb.com or freewebhost.com for this as they are free. 4. Now open tabnabb.js using a notepad , Search for "Enter your URL here" , Now replace it with your "Facebook.html" url which you uploaded in the previous step, finally save it and upload tabnabb.js to your hosting account. 5. After successfull upload, Check whether the hack is working, click on the google.html link and open it , Now open few new tabs , After some time you will see google page switched to your fake Facebook page. 6. To make url (name.webhost.com/index.html) short read this Previous article "How To Hide a Url | Change Url | Mask Url". 8. Now, send google.html page to victim inbox of which u want to hack Facebook account password. 9. When, he will login with this facebook phisher to his facebook account, a new file "log.txt" will be created which will contain facebook hacked password in plain text form and he will be redirected to Facebook.com/careers page to avoid suspecion. Thats it now you can hack Facebook account passwords using this Facebook hacking new technique Tabnabbing. If you have any problem in using this Facebook Phisher to hack Facebook account password, mention it in comments.. There are millions of people talking about Facebook Account Hacking Tricks. However, a few ones who are in depth in HTML coding and IT can do that. Therefore, hackers are trying to find the best and easiest way to Hack the Facebook Accounts. Everyone knows that hacking Facebook accounts is not so easy because Facebook uses the UFD2 Hash to encrypt their users’ passwords and secure their information. Hackers have achieved success in unleashing a trick to hack Facebook accounts.